Many runners hate hills because they’re hard. This is exactly why you need to include hill training into your training. Hills can increase your strength & speed. They also boost your confidence, improve form and help to minimize the chance of injury when you complete them on a soft surface (grassy hill). The muscles you use when completing a hill workout are the same as ones used for sprinting, so the strength you build will improve your speed. This article discusses the benefits of hill training and outlines when in your training plan they should be completed to achieve the maximum benefit. 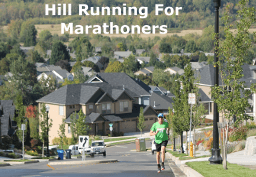 Lastly, I will provide some examples of hill training that can be performed for short races and other hill workouts that are best for ½ and full marathon training. Usually hill training is completed during the strength training phase of a plan. Similar to Fartlek and Tempo runs, hill workouts help you transition from base training to faster interval workouts. Typical hill workouts include a brisk running uphill with rest breaks on the flat or on the downhill. You can run at a sustained pace uphill, then relax back to conversation pace (catch your breath) on the downhills or flats. 15-30 minute of faster running is a good target. Paces depend on the grade and amount of repetitions. If you’re going by heart rate, target 85 – 95%. 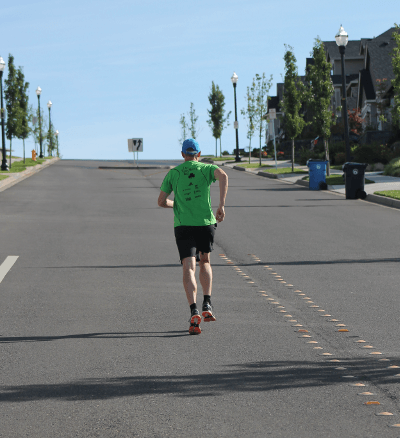 Before completing hill training I recommend starting with an easy warm-up at conversation pace for 10-15 minutes. Next complete some stretching exercises including lunges, leg swings & strides. Complete your workout and then finish with an easy cool down and stretching. Another benefit of hill training is that it can make you a more efficient runner because you’re training the cardio-respiratory and muscular systems to absorb, deliver and utilize oxygen while removing waste products such as lactic acid. Hills at conversation pace (just including hills during your general training). Just be cautious of doing too many hills and/or too often. A good example is picking a hilly course for whichever distance you run. A hilly long run is a great workout for ½ and full marathon training. Hilly out-and-back course. This is the most common and probably best way to get yourself into hill training for a marathon or half marathon. Run comfortably hard on the uphill and then relax or run controlled downhill. Be careful of running too fast/hard on downhills. The distance of these workouts depends on the athlete’s ability, goals and what kind of base/foundation they have. New or novice runners should simply just try running up the hill without stoping. Don’t worry about picking up the pace (hills are hard enough). 400m-1000m. Alternatively 1.5 – 4 minutes uphill. 5 – 8 repetitions with rest or easy jogging on downhill. Try to avoid hills that are too steep. I recommend no more than 7-8% grade. This workout is perfect for marathoners. 3 – 4 minutes for recovery depending on the length of the hill. Short hill (100m-400m) or 30 – 90 seconds. 5 – 8 repetitions with rest or easy jogging on downhill. Pace is faster than the longer uphills. Recovery is 1.5 – 2 minutes depending on the length of the hill. Combo hill. Instead of distance, run uphill and vary by time. Start at 1 minute uphill and increase by 1 minute up to 4 minutes. Then decrease by 1 minute for 7 total hills. This workout more closely simulates what you’ll see in a race where the size of hills varies. Downhill training – important for some race courses. Although it may be easier for your heart and lungs to run downhill, your legs certainly don’t get a break. It’s important to remember that you don’t want to run too fast downhills. I strongly recommend practice running downhill to prepare you for races like Big Sur and Boston. 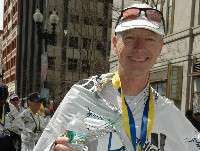 A perfect workout before the Boston Marathon is to add 2-3 miles of downhill after a long run of 14 – 18 miles. I recommend including various hill workouts in your training. Modify the distances and speed of each hill. For example, to start hills complete 3 x 600m at 10k pace and 3 x 200m at 5k pace. Last year, I ran Sauvie Island Marathon, which is flat, so I didn’t incorporate hill training into my 12 week plan. Instead, I ran hills in March, just before I started my plan. I completed the short hill workout by time. I completed 8 repetitions of 90 seconds. I didn’t complete any other hill training. In previous years when I ran either Portland or Boston, I included a lot more hill training in my plan. To prepare me for the last 6 miles at Boston (which is downhill), I would add 2+ miles of downhill after my 16-18 mile long runs. To prepare me for the St John’s Bridge in Portland (which is around the 15 mile point), I would finish my 14 – 18 mile long runs with a 2.5 miles uphill. For many runners out West or along the East Coast, finding a hill may not be an issue. However, you don’t need to live at elevation to get in a hill workout. For many athletes in the Midwest or Florida, where it’s flat, you may have to get creative with your hills or inclines. Try parking garages (just be careful) or stadium ramps. High school stadiums, office buildings or hotels with stairs could also be used, but the duration of the uphill will be shorter. A word of caution about stairs is to start with just a few stairs and then build up. Stairs can really stress your achilles. Another alternative for hills and stairs is using the treadmill or stair climber at the gym. If you’re completing stairs or stair climber workouts, ensure you stay sufficiently hydrated for longer workouts. Practice surging at the top of the hill with confidence & speed. The more you include hills in your training, the less intimidating they’ll seem when you face them in a race. Hill running is an important component of any well-rounded training plan. As you can see, hills will help you become a more complete athlete. The improved strength and technique you gain from regular hill workouts will provide you with a significant confidence boost when you’re racing.